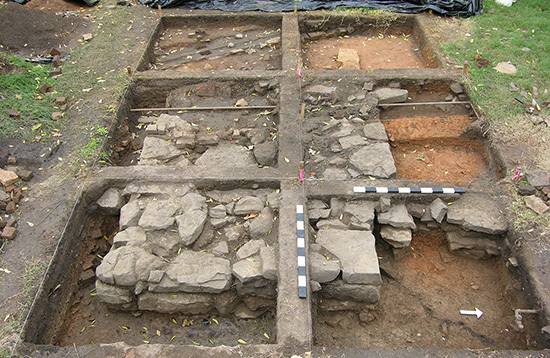 Excavations in Historic Washington State Park in southwestern Arkansas, 2011. Archeologists usually divide the past up into two large categories. Anything before written records is prehistoric and anything after is historic. The term “historical archeology” refers to the archeology of the recent past. In the case of Arkansas the term applies to sites that date to the initial period of European settlement and after. From the founding of Arkansas Post by the French in 1686, to World War II-era Prisoner-of-War camps, archeology has contributed much to our understanding of Arkansas’s more than 300 years of “recent” history. 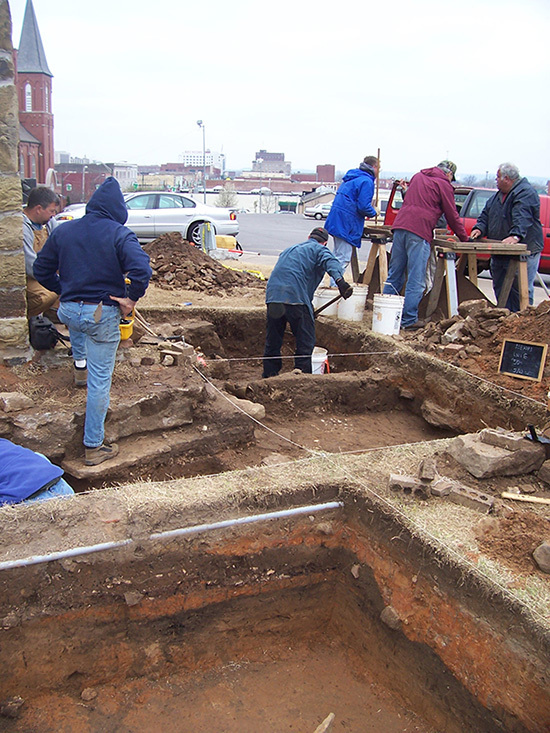 Excavations at St. Anne’s Convent of the Sisters of Mercy in Fort Smith, 2004. We have found lost places such as the very first Arkansas Post, which many assumed had eroded into the Arkansas River. We have also worked to relocate places that have faded into history leaving little in the archival record. Examples of this include the regionally important sawmill community of Van Winkle’s Mill in northwest Arkansas, and Davidsonville in Randolph County, an important early nineteenth-century town on the old Southwest Trail. In these examples we have helped State Parks interpret these places to the public. One can walk the Historic Van Winkle Trail in Hobbs State Park and Conservation Area, full of signage interpreting the locations discovered by archeologists, or visit the new interpretive center at Davidsonville Historic State Park and look at the impressive artifacts unearthed by Arkansas Archeological Survey staff. We have provided missing and supportive information for reconstructions and renovations at historic places. This includes finding the locations of detached kitchens and outbuildings associated with historic structures as well as finding evidence of the original footprint or architectural details of buildings that are still standing. Examples of this include the reconstruction of the Sanders Farmstead at Historic Washington State Park and the renovations of the 1836 Courthouse and the Abraham Block House in the same park. The Arkansas Archeological Survey has conducted excavations in connection with renovations at sites all across the state―from Lakeport Plantation in extreme southeast Arkansas, to the Old State House in Little Rock, to the Drennen-Scott House on the western edge of the state, and many others. The public reaps the benefits of these projects, often without knowing that archeology played a key role in the renovations. In addition to our service in reconstructions and interpretation, historical archeologists at the Arkansas Archeological Survey have contributed to the larger understanding of historical narratives in our state. Survey archeologists have challenged our stereotypes of Ozark history, added to our understanding of Civil War conflicts, explored what it means to be Jewish on the early nineteenth-century frontier in southwestern Arkansas, examined race, slavery, and emancipation at various sites across the state, and studied gender in places as diverse as detached kitchens in the antebellum south to Italian POW camps from the 1940s. 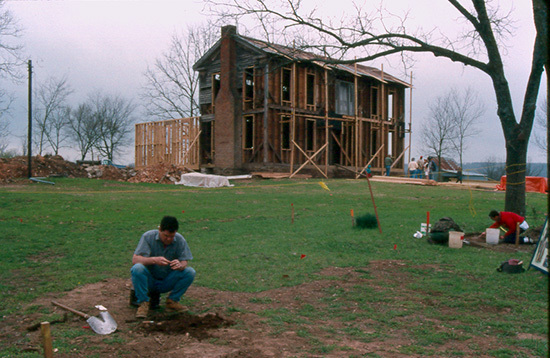 Excavations at Wilson Plantation in Washington County, 1994. 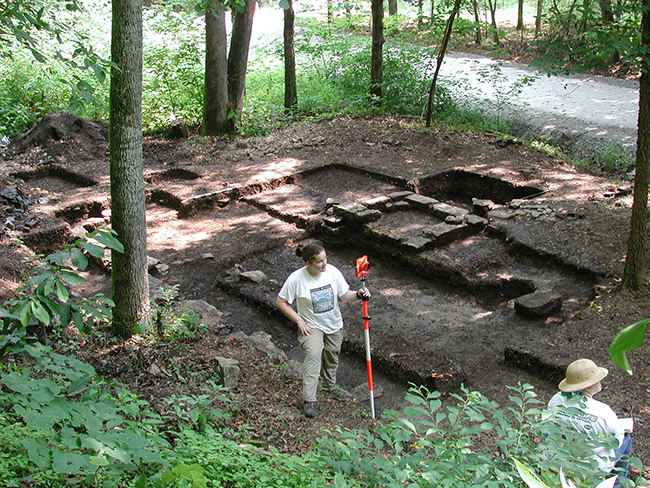 Excavations at the Drennen-Scott House in Van Buren. Alicia Valentino mapping excavations of a blacksmith shop at Van Winkle’s Mill, 2005. Some historical archeology was conducted in Arkansas at places like Fort Smith National Historic Site and Arkansas Post National Memorial before the Arkansas Archeological Survey existed. However, work on historical archeology in Arkansas dramatically accelerated following the founding of the Survey in 1967, and by the early 1970s work on historic period sites was already beginning to blossom in the state. 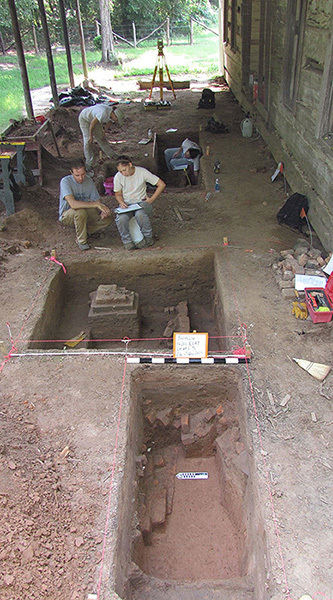 At first this was due to work by graduate students connected both with the University of Arkansas Anthropology Department and the Arkansas Archeological Survey—students such as Patrick Martin, David Stahle, and David Jurney. This first wave of historical archeology following the Survey’s founding took place all across the state―from investigations at Arkansas Post in southern Arkansas to work at the Ridge House in northwest Arkansas. Shortly thereafter, the Survey rapidly began to hire historical archeologists in staff positions. The first of these was Sam Smith (ASU Research Station Assistant) in the early 1970s, followed by two historically trained Research Station Archeologists, Drs. Leslie “Skip” Stewart-Abernathy (1977) and George Sabo (1979). Dr. Emily Beahm and Devin Pettigrew mapping a unit profile while investigating a cellar at Hollywood Plantation in Drew County, 2014. Stewart-Abernathy, in particular, began to conduct archeological research on an incredible number of historic period sites. This included five years of excavations at Historic Washington State Park (1980–1984), excavations in northwest Arkansas on historic farmsteads in the path of what would become I-49 (1982), and the documentation of the remains of boat wrecks strewn over 4 acres of exposed river bottom near West Memphis, Arkansas (1988). By the 1980s the Survey’s Sponsored Research Program, the arm of the organization that conducted work for state and federal agencies, was up and running and also conducting projects on historic sites. Notable projects conducted by Sponsored Research include work at Historic Washington State Park, Lakeport Plantation, the Old State House, the Lambert and Dement Farmsteads, and Davidsonville Historic State Park. Also of note is the excavation of Cedar Grove Cemetery in 1980. This project had an important impact on how federal agencies dealt with historic cemeteries. You can learn more about the Cedar Grove project here. In the 1990s Jerry Hilliard (UAF Research Associate) launched a series of historical archeology projects in northwest Arkansas including Mount Comfort Church, Wilson Plantation, Van Winkle’s Mill, the Peel House in Bentonville, Fitzgerald Station in Springdale, Town Center in Fayetteville, St. Anne’s Convent in Fort Smith, and Cross Hollows. Many of these projects featured collaborations with University of Arkansas graduate students such as Melissa Memory, Jamie Brandon, James Davidson, Brynn Berry, Robin Bowers, Terri Bruce, Alicia Valentino and many others. In the early decades of the twenty-first century a new generation of historical archeologists were hired as Research Station Archeologists at the Arkansas Archeological Survey (Drs. Jamie Brandon, Jodi Barnes, and Carl Drexler) and a new round of research began to take place. These new research projects explore familiar topics, like southern plantations and frontier towns (for instance, Hollywood Plantation in southeastern Arkansas and continuing work at Historic Washington State Park in southwestern Arkansas), but work has also expanded into understudied topics such as Civil War battlefields (e.g., Pea Ridge, Prairie Grove, Elkin’s Ferry, and Wallace’s Ferry), WWII POW camps (Camp Monticello), and the militarization of civilian landscapes during wartime (Dooley’s Ferry). Drexler, Carl (ed.) 2015 Historical Archaeology of Arkansas: A Hidden Diversity. University of Tennessee Press, Knoxville, TN. Kwas, Mary (ed.) 2008 “Historical Archaeology in Arkansas.” A special issue of Arkansas Historical Quarterly 67(4). Also visit our Publications page and download our catalog for books on historical archeology sites and projects in Arkansas.